Today we will look at the Toppletree. Toppletree is a fun and challenging fine motor game. Starting from the base, players try to build a branch of the tree with four consecutive color pieces without toppling the tree. 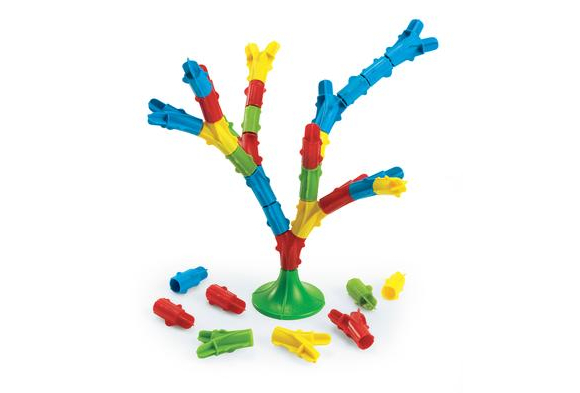 The game requires fine motor precision as the child must use muscle coordination to grade his placement of the pieces without toppling the tree. This game also assists the child in the development of planning and reasoning skills as they must be able to see how to get to their piece in the correct order while not compromising the tree’s balance. Use the tree as a simple construction toy. Rather than following the actual game rules, allow the child to simply build the tree and see how big they can make it without toppling it over. In a small group, each player selects a color and must build their branches using only that color. Taking turns, they must find a way to connect four consecutive pieces of the tree with their color. Develop color identification skills. Specify which color piece you want placed at any time and have the child place it. Increase the challenge by telling the child which color you want placed on another color (ie. “Place a blue piece on a yellow piece”). Using the idea above, develop social skills by having one child be the leader, calling out to the other children where they want different color pieces placed. For more information about the Toppletree and other great items please visit http://www.achievement-products.com.